With the recommendations of upper and lower limits in compression depth, it may be challenging for the lay rescuer to judge their compression depth without the use of feedback devices. Thus audio-visual feedback devices are recommended for use during CPR for real-time optimisation of CPR performance. In the market today, there are two types of CPR feedback technology: accelerometer based feedback and impedance based feedback. ZOLL utilises an accelerometer based feedback. An accelerometer, embedded in the electrodes, is used to measure chest compression displacement (distance) instantaneously in real-time. Accelerometers are the gold standard for real-time CPR feedback technology, as it is time tested and can be found anywhere from space rockets to cars, laptops and smartphones. Accelerometer based feedback accurately measures compression rate and depth, as per what the guidelines call for. Contrary to accelerometer based feedback, impedance based feedback monitors very slight changes in electrical impedance detected in the electrodes. It does not measure depth directly. Rather, it measures force and speed. The most important finding found that impedance based feedback is an accurate indicator of compression rate, but is an inaccurate measure of compression depth to help rescuers reliably. Designed with simplicity in mind, the CPR sensor is embedded into ZOLL’s electrode pads. The CPR sensor incorporates an accelerometer that measures accurate and precise displacement of the chest as it moves up and down. Its prominent mid-sternum location serves as a convenient landmark for hand placement. Accelerometers are a time tested technology, used in all modern-day applications from cars and rockets to smartphones. Real CPR Help uses rate, depth, and duty cycle to guide rescuers towards delivering compressions that meet recognized guidelines (in accordance with international guidelines (ILCOR, AHA, ERC) of compression depth: 5cm to 6cm, compression rate: 100-120cpm, minimizing chest compressions < 10 seconds). Further, it integrates these into a unique visual indicator that lets rescuers instantly see the quality of their effort. Depth is measured by filtering and converting the acceleration signal obtained from the CPR signal into displacement (i.e. up and down) and reported in inches or millimeters. 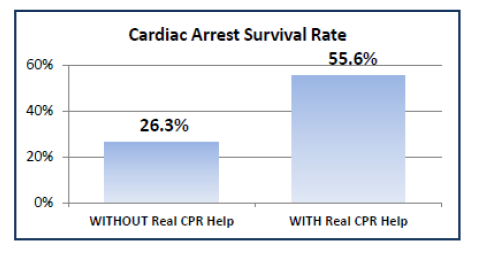 A whitepaper on how the displacement in Real CPR Help is measured and how its algorithm is validated details more. Accelerometer and Impedance Based CPR Feedback: What’s the Difference? Impedance based CPR feedback technology monitors very slight changes in electrical impedance detected in the electrodes, and measures the force and speed of chest compressions. This monitoring is claimed to allow an AED to infer the rate and depth of compressions in real-time, and claims equivalency to accelerometer-based feedback. This claim has yet to be proven clinically, with studies only conducted internally and on single porcine models. Impedance based feedback does not measure depth directly, as force measurement does not equate depth. The most important investigation of impedance based technology, published in a peer-reviewed journal article, found that monitoring impedance can detect the change in direction of chest compressions and can therefore monitor compression rate accurately. Please refer to Alonso et al. What’s the Difference between CPR Feedback and CPR Coaching? CPR feedback aims to improve the quality of CPR performed during a rescue, and authentic CPR feedback devices has the ability to provide information about what the rescuers are actually doing (compression rate, depth, CPR cycles, pauses in CPR) in real-time, so that they can make real-time adjustments in their CPR performance to achieve the high quality CPR that is now called for by the 2015 guidelines. On the other hand, CPR coaching devices do not provide information about the rescuer’s CPR performance; there is no feedback on compression depth or rate to measure if rescuers are performing good compressions that meet the guidelines. Rather it may measure patient impedance to determine if CPR has begun or not at all, provide a fixed metronome that does not detect pauses in CPR, or merely just provide video and voice coaching on how to perform compressions. ZOLL’s Real CPR Help is driven by CPR feedback technology, and because it actually ‘sees’ rescuers’ chest compressions and does not merely ‘tell’ rescuers how to do chest compressions, Real CPR Help is truly the only proprietary CPR feedback technology ahead of its time. Because it is an authentic, time tested CPR feedback device, ZOLL’s AEDs can provide in-depth post-clinical data that includes comprehensive and dynamic data on CPR quality. These data can be archived online and offline, in ZOLL’s clinical reporting and analysis software, available at no charge to customers. These reports are dynamic in fulfilling the needs of clinical reviewers. Effective chest compressions remain a crucial link – this translates into meeting adequate compression rate and depth as recommended by the international guidelines (ILCOR, AHA, ERC). Real CPR Help represents a breakthrough and gold standard in CPR feedback technology. It is designed to aid rescuers to meet the recommended guidelines and optimize the victim’s chance for survival. When it comes to assisting rescuers in providing the best CPR possible, no one is more experienced or can offer as much as ZOLL. ZOLL’s mission on improving survival outcomes drives our quality assurance to customers; this is reflected in the fact that ZOLL’s technologies save lives every single day across the world. The U.S. Food and Drug Administration (FDA) applies the most stringent requirements of any regulatory agency in the world, when clearing medical devices for sale based on both their safety and efficacy. Human clinical trials are required to ensure the utmost safety and efficacy of medical technologies. The FDA has never cleared an AED for sale in the U.S. that uses impedance monitoring technology for helping rescuers with both rate and depth of compressions, though they have cleared an AED that uses it only for rate of compressions. The AED Plus, in comparison, has been cleared by the USFDA for sale. 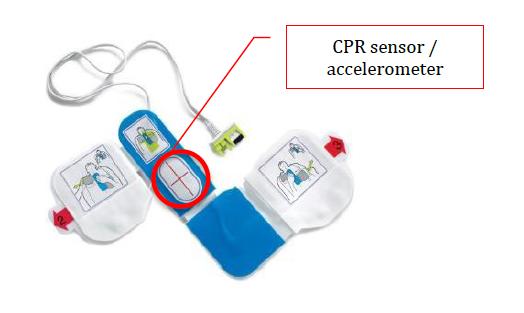 Regardless of what a manufacturer-funded paper may claim (especially one not published in a peer reviewed journal), the best research and the regulatory actions of the FDA indicate that Real CPR Help, using accelerometer technology, is superior to impedance monitoring technology when helping rescuers perform CPR. Please refer to Appendix A: AED Plus FDA Clearance Letter. In a study conducted by the Emergency Medical Services (EMS) in Mesa, Arizona, under the guidance of Dr. Ben Bobrow, it was proven that when Real CPR Help® was used, a sudden cardiac arrest victim was 2.7 times more likely to survive, because rescuers performed more and better CPR.4 Real CPR Help has acquired FDA approval, a mark of the highest quality in standards for safe and effective medical devices of public health importance. The ZOLL AED Plus® is the only AED that allows rescuers to see and hear how well they are performing the rate and depth of chest compressions during CPR in real-time. This real-time feedback, known as Real CPR Help®, makes the ZOLL’s AED portfolio the only AEDs that can help assess and treat nearly every SCA victim, making it the only full-rescue AED available today. ZOLL’s enhanced Real CPR Help® technology is fully compliant with international resuscitation guidelines, American Heart Association (AHA) and European Resuscitation Council (ERC) Guidelines (2015), as well as the National Resuscitation Council (NRC) guidelines for deeper CPR chest compressions to help responders provide high-quality CPR. ZOLL’s AEDs guides rescuers through the complete Chain of Survival, helping all sudden cardiac arrest victims, not just those who need a shock. Children are not little adults – children differ as to the types and characteristics of shockable and non-shockable heart rhythms, and thus it is important to correctly identify their specific heart rhythms. ZOLL has developed a dedicated pediatric AED analysis algorithm that accurately differentiates even the most difficult heart rhythms. ZOLL’s AEDs detects the use of either pediatric or adult electrode pads, automatically diagnoses the treatment required, and delivers a more optimized defibrillation energy level to effectively and safely treat a child, compared to other defibrillation waveforms. 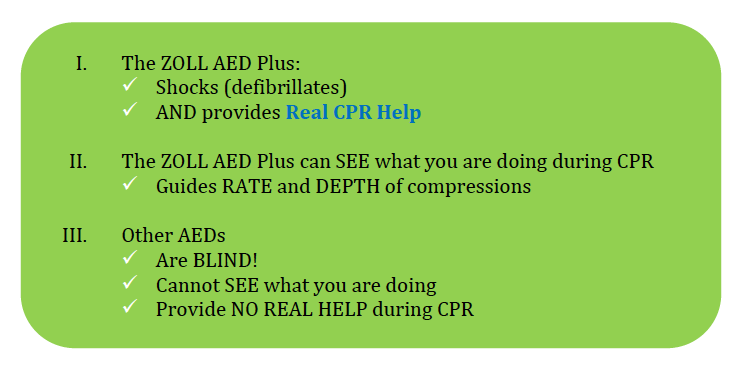 The ZOLL AEDs use the proprietary ZOLL algorithm that does not simply reduce energy. Please refer to Appendix B-Because Children Are Not Just Little Adults for more information. 1. 2015 American Heart Association Guidelines for Cardiopulmonary Resuscitation and Emergency Cardiovascular Care Science. Circulation. 2. Kelley, James, et al. “Eighth grade students become proficient at CPR and use of an AED following a condensed training programme.” Resuscitation 71.2 (2006): 229-236. 3. Malanga, B. & Geheb, F.J. A Primer to Real CPR Help Technology (2007). 4. Bobrow, Bentley J., et al. “The influence of scenario-based training and real-time audiovisual feedback on out-of-hospital cardiopulmonary resuscitation quality and survival from out-of-hospital cardiac arrest.” Annals of emergency medicine 62.1 (2013): 47-56. 5. Bohn, Andreas, et al. “The addition of voice prompts to audiovisual feedback and debriefing does not modify CPR quality or outcomes in out of hospital cardiac arrest–a prospective, randomized trial.” Resuscitation 82.3 (2011): 257-262. 6. Alonso, Erik, et al. “Can thoracic impedance monitor the depth of chest compressions during out-of-hospital cardiopulmonary resuscitation?.” Resuscitation 85.5 (2014): 637-643. 7. Mittal, S, Ayati S et al. Comparison of a rectilinear biphasic waveform with a damped sine wave monophasic waveform for transthoracic conversion of ventricular fibrillation. JACC, Vol 34, No 5, 1999. 8. Mittal S, Ayati S et al. Transthoracic Cardioversion of Atrial Fibrillation Comparison of Rectilinear Biphasic Versus Damped Sine Wave Monophasic Shocks. Circulation. 2000;101:1282-1287.